I have to admit, ‘Step Up 2 The Streets’ is not exactly the sort of movie that I’d frequent. Not that I don’t admire the dancing and the good looking cast that always accompanies such movies. It’s the banality of the plot that is unbearable. At times, I wished I haven’t spent money on such movies. Luckily, I didn’t pay for ‘Stomp the Yard’ when I reviewed it for THINK, and I wasn’t about to pay for this either. Andie (Briana Evigan) is a member of a street dancing crew. However, they dance illegally, and after a near-skirmish with the law, her guardian gives her a last chance at redemption: buck up, or move out to Texas, where they probably don’t have as many dance battles as Maryland. Having her last chance, she has to join a dance school, the Maryland School of Arts, where they don’t do ‘street dancing’ either; it’s ballet for you (ooh, suits you, sir :)). Getting kicked out of her dance crew, and falling in love with Chase (Robert Hoffman), she starts a crew of her own, consisting of the misfits of her school. Training together, they aim to win The Streets, a competition of the best dance crews around. Now, it’s easy to say that the acting’s not great. The same criteria goes for the story and its development. Plot holes? Certainly. Character development? That’s Korean to the filmmakers of this movie. Interesting, compelling and original dialogue? A big no-no. The ending? You can see it coming from a mile away. And even the music is monotonous at times; incredibly thumping and cool at the beginning, after a while, the cross marketing efforts of the studio makes the Missy Elliot and Missy Elliot-like music quite…well, boring. It’s easy to say all this. What isn’t easy was the amazing dance skills that the cast performed. I will probably dedicate an entire paragraph to the dancing alone, and the simple truth to be further expediated is this: in this movie, I have seen the human body move with such speed and verve that I never thought possible. The coordination was absolutely amazing, and I suppose in that sense, it hits the spot for the target audience of the movie: the MTV generation who likes to watch alpha males and females dance their hot bods on the silver screen. It probably goes without saying that I find Briana Evigan to be incredibly attractive. I suspect that similar feelings are inspired in females about Robert Hoffman. The same applies for the climactic sequence, and a climax in every sense of the word. The setting was well choreographed, which I had written about earlier. But the cinematography of the scene is also important. Quite frankly, great actions on screen won’t matter much without great camera work to get it on the screen in the first place. 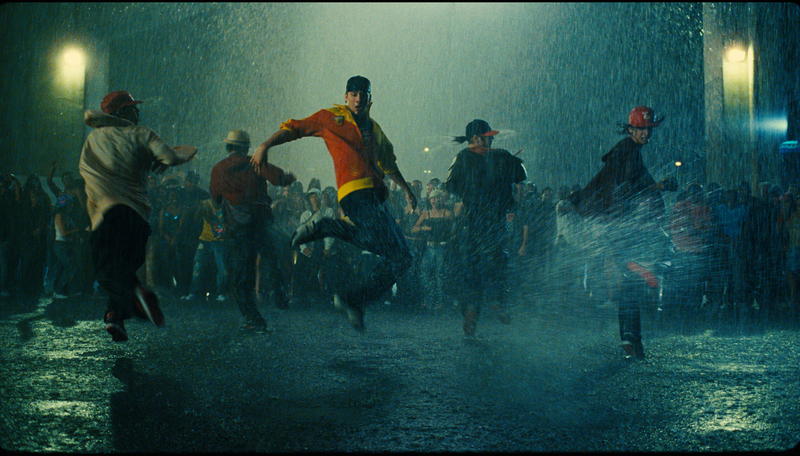 The rain of the final sequence added a whole other element to play around with, and it is an element that added vivacity to the already dynamic dancing. All in all, ‘Step Up 2’ is nothing but a cliché ridden film that is not that well executed to begin with. The drama part is quite boring, the bits in between the dancing has absolutely nothing that compels you to watch it further. Having said that, though all that may be forgotten almost as soon as you step out of the cinema, the dancing itself won’t quite leave you just yet. Whether it’s worth going into the cinema in the first place depends on whether you’re the sort of person who likes to step up to the plate to begin with. Siempre buscando musicales q me gusten hasta q encontres Stand Up 1 y 2 !! no es stand!! es step! !